[en] At first glance, the gloss that looks like a metal. However, if you actually learn it, it is truly unexpected lightness! The reason is the material and how to make it! The material is wood, a lacquer processing on it, and pressing the foil twice to coat it. We prepared a shape and size suitable for the glow of the chest. In addition, the chain which was a standard accessory is not a metal fitting, but it uses an excellent gem that shrinks freely up to 36 cm - 28 cm in the silk of Kyumi string. First of all, it is completion of "skin-friendly accessories" that we have not seen before. Even though the shoulders do not get stiff, the dazzling metal shine! 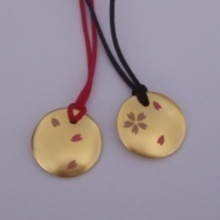 Why do not you add "Gomei's Pendant" born of advanced technology of foil pushing to one of your accessories? The wonderful quality of Japan is now the focus! Please also use it for gifts for loved ones. This is a round shape, M (diameter 4.5 cm × thickness 0.5 cm) and S (diameter 4 cm × thickness 0.5 cm) are two sizes. [en] At first glance, the gloss that looks like a metal. However, if you actually learn it, it is truly unexpected lightness! The reason is the material and how to make it! 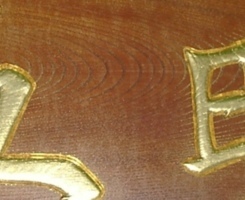 The material is wood, a lacquer processing on it, and pressing the foil twice to coat it. We prepared a shape and size suitable for the glow of the chest. In addition, the chain which was a standard accessory is not a metal fitting, but it uses an excellent gem that shrinks freely up to 36 cm - 28 cm in the silk of Kyumi string. First of all, it is completion of "skin-friendly accessories" that we have not seen before. Even though the shoulders do not get stiff, the dazzling metal shine! Why do not you add "Gomei's Pendant" born of advanced technology of foil pushing to one of your accessories? The wonderful quality of Japan is now the focus! Please also use it for gifts for loved ones. 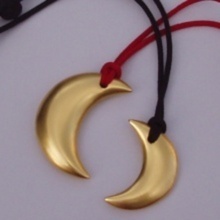 This is the moon in gold foil M (width 3 cm x 4 cm) and S (width 2.5 cm x height 3 cm) size. We will send it in a private box. [en] Gomei gold leaf craftwork which has a track record of processing works such as Tiffany Inc. of America for over 30 years examines "how to make the best use of the material? Show the technique of the work?" By special powder erosion processing with gold powder and platinum powder And thinking, it is the ultimate bamboo fabric bag that I made. Kyoto completed "The finest bag you can have, you can dress fashionably for parties and events," you completed. Very light! Because it is a bag knitted with bamboo. Among bamboo workers, we processed it with the highest grade foil eraser (foil powder made by hand crafting by hand) to the main body knitted special Beppu bamboo work "Wave Azillo". 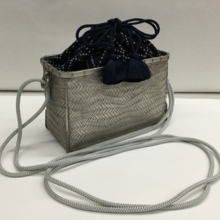 Specifications Linen bag: Nishijin weave Kei sewing, metal fittings: Rowjam eraser powder plating, shoulder: Kyoto braid double size: width 18 cm × height 13 cm × depth 8 cm (gusset 7 cm) double type braid shoulder 115 cm I put it in a box and send it out. It is a truly luxurious bag of soothing platinum extinguishing powder. When it is special, how about a bag full of flying made in Japan? [en] Gomei gold leaf craftwork which has a track record of processing works such as Tiffany Inc. of America for over 30 years examines "how to make the best use of the material? Show the technique of the work?" By special powder erosion processing with gold powder and platinum powder And thinking, it is the ultimate bamboo fabric bag that I made. Kyoto completed "The finest bag you can have, you can dress fashionably for parties and events," you completed. Very light! Because it is a bag knitted with bamboo. Among bamboo workers, we processed it with the highest grade foil eraser (foil powder made by hand crafting by hand) to the main body knitted special Beppu bamboo work "Wave Azillo". 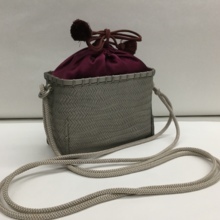 Specifications Medium bags: silk satin, metal fittings: rougeum eraser powder plating, shoulder: Kyoto braid double size: width 20 cm × height 12 cm × depth 7 cm (gusset 7 cm) double type braid shoulder 115 cm Products are dedicated boxes We will put it in and send it out. It is a truly luxurious bag of soothing platinum extinguishing powder. When it is special, how about a bag full of flying made in Japan? [en] Gomei gold leaf craftwork which has a track record of processing works such as Tiffany Inc. of America for over 30 years examines "how to make the best use of the material? Show the technique of the work?" By special powder erosion processing with gold powder and platinum powder And thinking, it is the ultimate bamboo fabric bag that I made. Kyoto completed "The finest bag you can have, you can dress fashionably for parties and events," you completed. Very light! Because it is a bag knitted with bamboo. Among bamboo workers, we processed it with the highest grade foil eraser (foil powder made by hand crafting by hand) to the main body knitted special Beppu bamboo work "Wave Azillo". 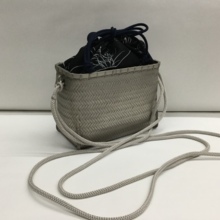 Specifications Medium bag: silk satin, metal fittings: rougeum eraser powder plating, shoulder: Kyoto braid double size: width 20 cm × height 12 cm × depth 8.5 cm (gusset 8.5 cm) double type braid shoulder 110 cm Products are dedicated boxes We will put it in and send it out. It is a truly gorgeous bag with a calm quenching different from gold leaf. When it is special, how about a bag full of flying made in Japan? [en] Gomei gold leaf craftwork which has a track record of processing works such as Tiffany Inc. of America for over 30 years examines "how to make the best use of the material? Show the technique of the work?" By special powder erosion processing with gold powder and platinum powder And thinking, it is the ultimate bamboo fabric bag that I made. Kyoto completed "The finest bag you can have, you can dress fashionably for parties and events," you completed. Very light! Because it is a bag knitted with bamboo. Among bamboo workers, we processed it with the highest grade foil eraser (foil powder made by hand crafting by hand) to the main body knitted special Beppu bamboo work "Wave Azillo". 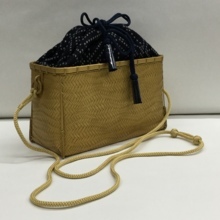 Specifications inner bag: Nishijin sushiko weave, metal fittings: rougeum eraser powder plating, shoulder: Kyoto braid double size: width 20 cm × height 12 cm × depth 8.5 cm (gusset 9 cm) double type braid shoulder 120 cm I put it in a box and send it out. It is a truly gorgeous bag with a calm quenching different from gold leaf. When it is special, how about a bag full of flying made in Japan? [en] Gomei gold leaf craftwork gold leaf craft with track record of work of art such as Tiffany, America, etc. for more than 30 years, "How to make the best use of the material? Show the skill of the work?" 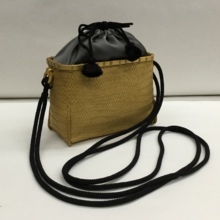 By special fire-fighting processing with gold powder and platinum powder Thinking about examining, is the ultimate bamboo fabric bag that we made. Kyoto completed "The finest bag you can have, you can dress fashionably for parties and events," you completed. Very light! Because it is a bag knitted with bamboo. Among bamboo workers, we processed it with the highest grade foil eraser (foil powder made by hand crafting by hand) to the main body knitted special Beppu bamboo work "Wave Azillo". 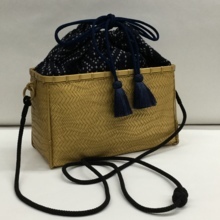 Specifications Inner pouch: pencil, metal fittings: gold eraser powder plating, shoulder: Kyoto braid size: width 21 cm × height 13 cm × depth 9 cm (gusset 9 cm) shrink type braid shoulder 140 to 95 cm The product is in a private box I will put it in and send it out. It is a truly gorgeous bag with a calm quenching different from gold leaf. When it is special, how about a bag full of flying made in Japan? [en] Gomei gold leaf craftwork which has a track record of processing works such as Tiffany Inc. of America for over 30 years examines "how to make the best use of the material? Show the technique of the work?" By special powder erosion processing with gold powder and platinum powder And thinking, it is the ultimate bamboo fabric bag that I made. Kyoto completed "The finest bag you can have, you can dress fashionably for parties and events," you completed. Very light! Because it is a bag knitted with bamboo. Among bamboo workers, we processed it with the highest grade foil eraser (foil powder made by hand crafting by hand) to the main body knitted special Beppu bamboo work "Wave Azillo". 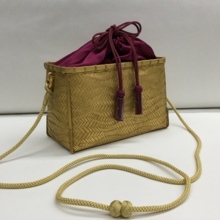 Specifications Medium bag: silk satin, metal fittings: gold eraser powder plating, shoulder: Kyoto braid double size: width 16 cm × height 12 cm × depth 7 cm (gusset 7 cm) double type braid shoulder 110 cm Products are dedicated box We will put it in and send it out. It is a truly gorgeous bag with a calm quenching different from gold leaf. When it is special, how about a bag full of flying made in Japan? 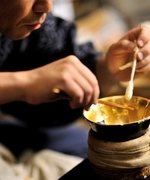 [en] It is a collaboration work with Gomei gilt craft art original Yamanaka lacquer ware. Why do not you enjoy it with this sweet sake in a rich drinking evening with Choco-in (with Inoguchi), which makes "lumpy" which made use of five grain commonly used in life! 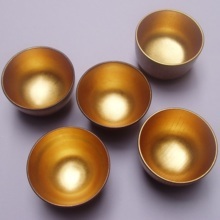 I pushed the pure gold leaf twice in the vessel and went up and finished luxuriously.橅 (beech) is dense and hard, Kaede has fine grain of grain, glossy, narca is dense and heavy, cherry blossoms are hard and beautiful, 欅 has beautiful wood grain and has a property that the material is hard to go wrong. The characteristics of wooden vessels, if used, is to show a different taste! This is not a good deals 5 pieces, but 1 piece sold. * When certainly ordering, please fill in "Type of wood" which is in color photograph. [en] It is a collaboration work between Gomei gold leaf art and Yamanaka lacquerware. Why do not you enjoy this with a sweet drink in a rich drinking time with Choco-in (with Inoguchi), making the "gourd sweet" that made use of the grain that is often used in daily life more luxurious! I pushed the pure gold leaf twice in the vessel, and went up and finished luxuriously. Particularly because of the material 欅, the wood grain firmly comes out, the color is also vermillion black and the contrast with the gold leaf fits well. The characteristics of wooden vessels, if used, is to show a different taste! This type is also available for entertainment. [en] It is a collaboration work between Gomei gold leaf arts and Yamanaka lacquerware. Why do not you enjoy this with a sweet drink in a rich drinking time with Choco-in (with Inoguchi), making the "gourd sweet" that made use of the grain that is often used in daily life more luxurious! I pushed the pure gold leaf twice in the vessel, and went up and finished luxuriously. Particularly because of the material 欅, the wood grain firmly comes out, the color is also vermillion black and the contrast with the gold leaf fits well. The characteristics of wooden vessels, if used, is to show a different taste! This type is also available for entertainment. [en] Gomei gold leaf craftwork which has a track record of processing works such as Tiffany Inc. of America for over 30 years examines "how to make the best use of the material? Show the technique of the work?" By special powder erosion processing with gold powder and platinum powder And thinking, it is the ultimate bamboo fabric bag that I made. Kyoto completed "The finest bag you can have, you can dress fashionably for parties and events," you completed. Very light! Because it is a bag knitted with bamboo. Among bamboo workers, we processed it with the highest grade foil eraser (foil powder made by hand crafting by hand) to the main body knitted special Beppu bamboo work "Wave Azillo". 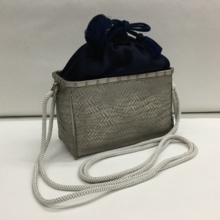 Specifications Medium bag: silk satin, metal fittings: gold eraser powder plating, shoulder: Kyoto braid size: width 20 cm × height 13 cm × depth 9 cm (gusset 9 cm) shrink type braided shoulder 115 to 80 cm Products are dedicated box We will put it in and send it out. It is a truly gorgeous bag with a calm quenching different from gold leaf. When it is special, how about a bag full of flying made in Japan? [en] Gomei gold leaf craftwork with a track record of processing works such as Tiffany Inc. in the United States for more than 30 years, "How to make the best use of the material? How can you show the technique of the work?" By special powder erosion processing with gold powder and platinum powder? Thinking about examining, is the ultimate bamboo fabric bag that we made. Kyoto completed "The finest bag you can have, you can dress fashionably for parties and events," you completed. Very light! Because it is a bag knitted with bamboo. Among bamboo workers, we processed it with the highest grade foil eraser (foil powder made by hand crafting by hand) to the main body knitted special Beppu bamboo work "Wave Azillo". 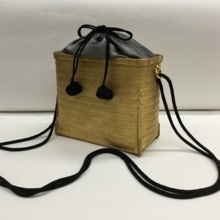 Specifications Medium bags: silk satin, metal fittings: gold plating, shoulder: Kyoto braid size: width 21 cm × height 18 cm × depth 9 cm (gusset 9 cm) double braided shoulder 125 cm Products are put in a private box I will send it out. It is a truly gorgeous bag with a calm quenching different from gold leaf. When it is special, how about a bag full of flying made in Japan? [en] Gomei gold leaf craftwork which has a track record of processing works such as Tiffany Inc. of America for over 30 years examines "how to make the best use of the material? Show the technique of the work?" By special powder erosion processing with gold powder and platinum powder And thinking, it is the ultimate bamboo fabric bag that I made. Kyoto completed "The finest bag you can have, you can dress fashionably for parties and events," you completed. Very light! Because it is a bag knitted with bamboo. Among bamboo workers, we processed it with the highest grade foil eraser (foil powder made by hand crafting by hand) to the main body knitted special Beppu bamboo work "Wave Azillo". 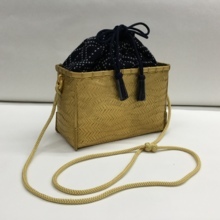 Specifications Medium bag: Silk satin, metal fittings: gold eraser powder plating, shoulder: Kyoto braid size: width 20 cm × height 13 cm × depth 8.5 cm (gusset 9 cm) shrink type braided shoulder 120 to 70 cm Products are dedicated box We will put it in and send it out. It is a truly gorgeous bag with a calm quenching different from gold leaf. When it is special, how about a bag full of flying made in Japan? iPhone 7/8/6 common cover "Gold specification"
[en] This mobile cover is made by Gomei gold leaf craftwork by repeatedly conducting various researches on materials to know the splendor of the gold leaf which is said to be "the world's thinness and beauty in the world" made in Kanazawa, Japan It is a work. Polycarbonate, which is a cover material, is difficult to apply chemical treatment and heat treatment by causing various reactions, so the surface is double coating finished with primer and urethane. In addition, please be aware that coating may be peeled off when applying or dropping impact on the surface. 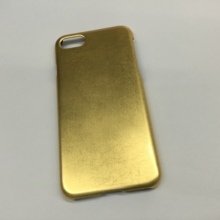 Through mobile / IQOS cover as everyday goods, I am pleased that you can enjoy the world of 'bordered gold leaf' which is said to be the world's thinness and beauty in the world. We will ship this work in a private box. It is a collaboration work with Gomei gilt craft art original Yamanaka lacquer ware. Why do not you enjoy it with this sweet sake in a rich drinking evening with Choco-in (with Inoguchi), which makes "lumpy" which made use of five grain commonly used in life! 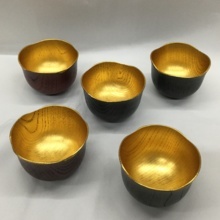 I pushed the pure gold leaf twice in the vessel and went up and finished luxuriously.橅 (beech) is dense and hard, Kaede has fine grain of grain, glossy, narca is dense and heavy, cherry blossoms are hard and beautiful, 欅 has beautiful wood grain and has a property that the material is hard to go wrong. The characteristics of wooden vessels, if used, is to show a different taste! This is not a good deals 5 pieces, but 1 piece sold. * When certainly ordering, please fill in "Type of wood" which is in color photograph. Es un trabajo de colaboración con la artesanía de hoja Gomei original de oro laca Yamanaka. Utilizando los cinco grano que se utiliza a menudo en la vida "única causa" del, para tener una, Innovación chocolate de lujo más (y Inoguchi) en la bebida rica noche, no gozan sólo en esta causa! Y por encima del suelo y presione la hoja de oro pura dos veces en el buque estaba acabado de lujo.橅 (haya) es duro y denso, madera de arce es que hay un fino brillo, el roble es un árbol de cerezo maravillosamente pesado es duro y denso, zelkova tiene la difícil naturaleza del grano de desviación es un material hermoso. Si las características del árbol de la embarcación es Tsukaikome, también es para mostrar un sabor diferente! Esto no es bueno en cinco sets, es una venta. Cuando seguro de sus ※ orden, que se encuentra en la foto en color de Rellene el "tipo de árbol". Gomei 금박 공예 원래 산중 칠기와 공동 작품입니다. 생활 속에서 자주 사용되는 5 개의 나뭇결을 살린 「ぐい呑 몸 ​​'을 더 고급 스러움을 갖게 초코 계속 (이노와) 풍부한 반주이 ぐい呑 몸에서 즐겨 보지 않겠습니까! 그릇에 순수한 금박을 두 번 눌러 위 난간하고 사치스럽게 마무리했다.橅 (너도밤 나무)은 치밀하고 단단한 단풍 나무는 나뭇결이 치밀하게 윤기가 있고, 참나무는 치밀하고 무겁고 벚꽃은 단단하고 아름다운 느티 나무는 나뭇결이 아름답고 재질이 차질 어려운 성질을 가지고 있습니다. 나무 그릇의 특징은 쓰면 또 다른 맛을 보여주는 것이군요! 이곳은 상품 5 개 세트가 아닌 1 개 판매합니다. ※ 반드시 주문시 색상의 사진에 있습니다 "나무의 종류"를 기입하십시오. Il est un travail de collaboration avec l'artisanat de feuilles d'or Gomei laqués Yamanaka d'origine. En utilisant les cinq grains qui est souvent utilisé dans la vie du « bien que », d'avoir un plus luxueux, le chocolat Innovation (et Inoguchi) dans la riche boisson du soir, ne bénéficient pas dans ce souci que! Et au dessus du sol et appuyez sur la feuille d'or pur à deux reprises dans le vaisseau était fini de luxe.橅 (hêtre) est dur et dense, le bois d'érable est il est un brillant beau, le chêne est magnifiquement cerisier lourd est dur et dense, zelkova a la nature difficile du grain d'écart est un beau matériau. Si les caractéristiques de l'arbre du navire est Tsukaikome, il est aussi de montrer une saveur différente! Ce n'est pas bon cinq ensemble, est une vente. Lorsque sûr de votre ※ de commande, situé dans la photo couleur de S'il vous plaît remplir le « type d'arbre ». Đó là một tác phẩm hợp tác với hàng thủ công lá Gomei vàng gốc Yamanaka sơn mài. Bằng cách sử dụng các lăm hạt thường được sử dụng trong đời sống "vì chỉ", có một, Innovation sôcôla sang trọng hơn (và Inoguchi) trong buổi tối uống phong phú, không thích chỉ vì lợi ích này! Và so với mặt đất và nhấn lá vàng nguyên chất hai lần trong tàu đã hoàn thành sang trọng.橅 (sồi) là cứng và dày đặc, gỗ maple là có một bóng tốt, sồi là cây anh đào đẹp nặng là cứng và dày đặc, Zelkova có tính chất khó khăn của hạt lệch là một vật liệu đẹp. Nếu các tính năng của cây của tàu là Tsukaikome, cũng có thể nó là để cho thấy một hương vị khác nhau! Đây không phải là tốt lăm bộ, là một bán. Khi luôn đặt hàng ※, nằm trong các bức ảnh màu của Vui lòng điền vào "loại cây". มันเป็นงานที่ทำงานร่วมกันกับงานฝีมือใบ Gomei ทองเดิม Yamanaka เครื่องเขิน ใช้เมล็ดห้าที่มักจะถูกนำมาใช้ในชีวิต "ประโยชน์เท่านั้น" ที่จะมีความหรูหรามากขึ้นนวัตกรรมช็อคโกแลต (และ Inoguchi) ในเครื่องดื่มยามเย็นที่อุดมไปด้วยไม่ได้ในประโยชน์นี้เท่านั้น! และเหนือพื้นดินและกดทองคำเปลวบริสุทธิ์สองครั้งในเรือก็จบหรู橅 (บีช) เป็นเรื่องยากและมีความหนาแน่นไม้เมเปิ้ลก็คือมีเงาดี, โอ๊คเป็นต้นไม้เชอร์รี่หนักสวยงามเป็นเรื่องยากและหนาแน่น zelkova มีธรรมชาติที่ยากลำบากของการเบี่ยงเบนข้าวเป็นวัสดุที่สวยงาม หากคุณสมบัติของต้นไม้ของเรือคือ Tsukaikome ยังมันคือการแสดงให้รสชาติที่แตกต่างกัน! นี้ไม่ดีห้าชุดเป็นหนึ่งขาย เมื่อแน่ใจว่า※สั่งซื้อของคุณอยู่ในภาพสีกรุณากรอกข้อมูลลงใน "ชนิดของต้นไม้"
Es ist eine Zusammenarbeit der Arbeit mit Gomyo Blattgold Handwerk Original Yamanaka Lacquerware. Unter Verwendung das fünf Korn, das oft im Leben verwendet wird, die „sake nur“, eine luxuriöse, Schokolade Innovation zu haben (und Inoguchi) in reichem Abend trinken, genießt nicht nur in diesem willen! Und über den Boden und drücken Sie das reine Blattgold zweimal im Gefäße war Luxuxende.橅 (Buche) hart und dicht ist, Ahornholz gibt es einen feinen Glanz, Eiche ist schön schwer Kirschbaum hart und dicht ist, zelkova die schwierige Art der Abweichung Korn hat ein schönes Material ist. Wenn die Merkmale des Baumes des Schiffs Tsukaikome ist, ist es auch möglich, einen anderen Geschmack zu zeigen! Das ist nicht gut-five-Set, ist ein Verkauf. Wenn Sie sicher von Ihrer Bestellung ※, in dem Farbfoto gelegen von Bitte geben Sie die „Art von Baum“. Ia adalah karya kerjasama kraf daun Gomei emas asal Yamanaka lacquerware. Menggunakan lima bijirin yang sering digunakan dalam kehidupan "demi sahaja", mempunyai lebih mewah, Inovasi coklat (dan Inoguchi) dalam minuman petang kaya, tidak menikmati dalam demi ini sahaja! Dan di atas tanah dan tekan daun emas tulen dua kali dalam kapal adalah penamat mewah.橅 (beech) adalah keras dan padat, maple kayu adalah terdapat gloss baik, oak adalah pokok ceri yang sangat cantik, berat adalah sukar dan padat, ZELKOVA mempunyai sifat yang sukar gandum sisihan adalah bahan yang indah. Jika ciri-ciri pokok vesel itu Tsukaikome, juga ia adalah untuk menunjukkan rasa yang berbeza! Ini tidak baik-lima set, adalah satu jualan. Apabila pasti ※ pesanan anda, bertempat di photo warna Sila isikan "jenis pokok". É um trabalho de colaboração com folha Gomei ouro artesanato originais laca Yamanaka. Utilizando os cinco grão que é usado frequentemente na vida "única questão" o, para ter um mais luxuoso, Inovação de chocolate (e Inoguchi) na bebida rica noite, não gozam em apenas esta causa! E acima do solo e pressione a folha de ouro puro duas vezes no vaso foi acabamento de luxo.橅 (faia) é dura e densa, madeira de bordo é que há uma multa brilho, carvalho é uma árvore de cereja lindamente pesado é dura e densa, zelkova tem a natureza difícil de grãos desvio é um material bonito. Se as características da árvore do navio é Tsukaikome, também é mostrar um sabor diferente! Isso não é bom de cinco sets, é uma venda. Quando certeza de seus ※ ordem, localizados na foto cor de Por favor preencha o "tipo de árvore". فهو عمل بالتعاون مع الحرف ورقة Gomei الذهب الأصلي كية ياماناكا. الاستفادة من الحبوب الخمس التي غالبا ما تستخدم في الحياة "أجل فقط"، لدينا أكثر الفاخرة والابتكار الشوكولاته (واينوغوشي) في الشراب مساء الغنية، لا تتمتع في هذا مصلحة فقط! وفوق الأرض والضغط على ورقة الذهب الخالص مرتين في السفينة أن تسديدة الفاخرة.橅 (الزان) من الصعب وكثيفة، خشب القيقب هو ان هناك لمعان على ما يرام، والبلوط وشجرة الكرز الثقيلة جميل من الصعب وكثيفة، زيلكوفا لديه الطبيعة الصعبة من الحبوب الانحراف هو مادة جميلة. إذا كانت ملامح شجرة السفينة Tsukaikome، كما أنه هو إظهار نكهة مختلفة! هذا ليس جيدا خمسة مجموعة، هو عملية بيع واحدة. عندما تأكد من ※ طلبك، وتقع في الصورة لون الرجاء تعبئة "نوع من شجرة". Io sono un lavoro di collaborazione con foglia oro Gomei l'artigianato originale lacca Yamanaka. Utilizzando i cinque grano che viene spesso utilizzato nella vita "solo amor" la, per avere una più lussuosa, Innovazione cioccolato (e Inoguchi) in bevanda ricca di sera, non godono solo in questo amore! E fuori terra e premere la foglia d'oro puro per due volte nel vaso era rifiniture di lusso.橅 (faggio) è duro e compatto, legno di acero è c'è una bella lucentezza, quercia è ben pesante ciliegio è duro e denso, zelkova ha la difficile natura del grano deviazione è un materiale bellissimo. Se le caratteristiche dell'albero della nave è Tsukaikome, inoltre è di mostrare un sapore diverso! Questo non è buono-cinque set, è una vendita. Quando sicuri delle vostre ※ ordine, che si trova nella foto a colori di prega di compilare il "tipo di albero". Это совместная работа с Gomei позолотой ремесел оригинальный Яманака лакированные. Используя пять зерна, который часто используется в жизни «только ради», чтобы иметь более роскошный, шоколад инноваций (и Иногути) в богатый вечерний напиток, не пользуются только этим ради! И над землей и нажмите чистый золотой лист дважды в сосуде была роскошь отделки.橅 (бук) является твердым и плотным, клен дерево есть прекрасный блеск, дуб красиво тяжелая вишня жесткая и плотная, дзельквы имеет сложный характер отклонение зерна является прекрасным материалом. Если особенности дерева сосуда Tsukaikome, также, чтобы показать другой вкус! Это не хорошо-пять набора, это одна продажи. Если уверены в своем ※ заказе, расположенном в цветовом фото Пожалуйста, заполните «вид дерева». Jest to praca współpraca z rzemiosła Gomei Złoty liść oryginalnego Yamanaka laki. Wykorzystując pięć ziarno, które jest często używane w życiu „tylko sake” the, aby mieć bardziej luksusowe, innowacyjność Czekolada (i) w bogatej Inoguchi wieczornego drinka, nie korzystają tylko w tym dobra! I nad ziemią i naciśnij czystego złota liść dwa razy w naczyniu było luksusowe wykończenie.橅 (buk) jest twardy i gęsty, drewno klonowe jest istnieje cienka połysk, dąb jest pięknie ciężki wiśniowe drzewo jest twardy i gęsty, Zelkova ma trudny charakter odchylenia ziarna jest piękny materiał. Jeśli cechy drzewa statku jest Tsukaikome, również to, aby pokazać inny smak! To nie jest dobre pięć set, jest jednym sprzedaż. Kiedy pewien swoich ※ rzędu, zlokalizowanych na zdjęciu koloru proszę wypełnić „niby drzewa”. Det är ett samarbete arbete med Gomei bladguld hantverk original Yamanaka lacquerware. Använda fem korn som ofta används i livet "bara skull" det, att ha en lyxigare, choklad Innovation (och Inoguchi) i rika drink på kvällen, inte åtnjuter endast denna skull! Och ovan jord och tryck på rent bladguld två gånger i kärlet var lyx finish.橅 (bok) är styv och tät, är lönnträ finns det en fin glans, ek är vackert tung körsbärsträd är hård och tät, Zelkova har den svåra naturen av galna korn är ett vackert material. Om funktionerna i trädet av fartyget är Tsukaikome, det är också att visa en annan smak! Detta är inte bra-fem set, är en försäljning. När säker på din beställning ※, som ligger i färgfoto av Fyll i "typ av tree". Det er et samarbeid arbeid med Gomei bladgull håndverk opprinnelige Yamanaka lacquerware. Utnytte de fem korn som ofte brukes i livet "skyld bare", for å få en mer luksuriøs, sjokolade innovasjon (og Inoguchi) i rike kveldsdrink, ikke nyte i denne sake bare! Og over bakken, og trykk den rene bladgull to ganger i fartøyet var luksus finish.橅 (bøk) er hardt og tett, er lønnetre er det en fin glans, eik er vakkert tung kirsebær treet er hardt og tett, Zelkova har den vanskelige natur avvik korn er en vakker materiale. Hvis funksjonene i treet av fartøyet er Tsukaikome, det er også å vise en annen smak! Dette er ikke bra-fem sett, er ett salg. Når sikker på dine ordre ※, som ligger i fargebilde av Vennligst fyll ut "type treet". Det er et samarbejde arbejde med Gomei bladguld håndværk oprindelige Yamanaka lacquerware. Ved hjælp af fem korn, der ofte bruges i livet på "skyld kun", at have en mere luksuriøs, chokolade Innovation (og Inoguchi) i rigt aften drikke, ikke nyder i kun denne skyld! Og over jorden, og tryk på rent guld blad to gange i beholderen var luksus finish.橅 (bøg) er hård og tæt, ahorntræ er der en fin glans, eg er smukt tung kirsebærtræet er hård og tæt, zelkova har den vanskelige karakter af afvigelse korn er et smukt materiale. Hvis funktionerne i træet af fartøjet er Tsukaikome, også er det for at vise en anden smag! Det er ikke godt fem sæt, er et salg. Når sikker på din ordre ※, som ligger i farvefoto af Udfyld "slags træ".